This year we are very proud to propose two Nepalese teas in our assortment: a green tea “Bi Luo Chan” and Oolong tea “Oolong Wonder”. These teas come from cooperative of small “planters” or “farmers” of Ilam region of Nepal. There are 24 owners of small plantations and all production of tea is hand rolled. These plantations are located at high altitude from 1800m and manual harvest follows a very traditional ritual, which requires picking. 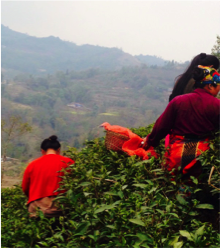 Both Nepalese teas we carry this year come from a small tea hamlet nestled in the up mountain district of Ilam. Ilam district is located in the far eastern part of Nepal adjoining Sikkim and Darjeeling hills of India parallel to the “Mai Pokhari Ramsar Site” a world heritage site in Nepal for wetlands. „Mai Pokhari“ in Nepal stands for mothers lake if translated literally. This famous tectonic lake lies at 2200 meters from the sea level and often visited by pilgrims from all over the country. This tranquil environment makes the bio diversity of this place very unique which harbors many endangered species of wild flora and fauna. This tea Plantation was initiated somewhere in the year 1990 with the plants derived from high quality tea varieties planted locally by traditional farmers. The plantation is very young therefore, the quality of tea is considered high as compared to many other tea areas of Nepal. Tea cultivation is carried out by marginal local farmers in their own land and therefore, it’s an entirely farmer based production with the ownership remaining at farmers level. This self-sufficient vision arose among the farmers only last year (2014) having being exploited by traders who supplied green tea leaves to large factories, since the first harvest of tea. So, we are proud to support them in this project and to promote the quality of their work. The plantations areas lie between 1820 meters to 1864 meters above sea level. Tea crafted at such altitudes falling within 26 degree North provides flavors and character, which cannot be replicated elsewhere. Bi-lochan leaves are select from bushes with high chlorophyll contents. The cultivar resembles the famous Chinese green tea, Bi-lochan. The leaves are crafted in osmosis and respect of the mystic natures of Nepalese culture. Leaves have lime brightness and offer sweet grassy or vegetal aromas. The light green liquor has a lively fresh taste evoking visuals of green Himalayan forests and hills. This green tea can be best enjoyed with soft water warmed up to 80 degrees for two minutes and a sweeter taste can be realized if infused for 4 minutes in the second infusion. Not to be confused - Bi Luo Chan from Nepal and Bi Luo Chun from China. Bi Luo Chun is the rarest and most prestigious tea of China. The harvest: a small bud is accompanied by one unique leaf. This kind of picking is extremely rare. It explains the high price of the tea. The name means « Spring Jade Spiral ». In one day, each picker harvesting about 2 kilos of fresh leaves, which makes about only 200 grams of tea after drying. Bi Luo Chun is manufactured in a big wok and must be done with certain dexterity, as the temperature can rise to 180 degrees in the large container. That’s the reason of wearing cotton gloves.